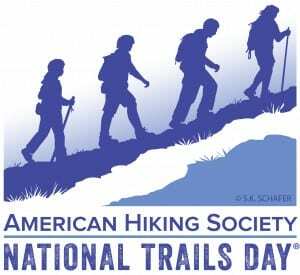 Saturday, June 1st is National Trails Day, where people all over the country will be getting out to enjoy and build up our trails. We’re lucky to have so many great trails in the parks and along the waterways in NJ and if you go out any time from sunrise to sunset, the crowds will tell you how popular they are for both recreation and transport. Where do you wish we had a trail where we don’t? I know the extension of the Trolley Line Trail as part of the Knight Trail is one item on the wish list of the students in West Windsor and Plainsboro. Where else would a trail help you to get around more safely and comfortably, or help you to get out and about walking and hiking? 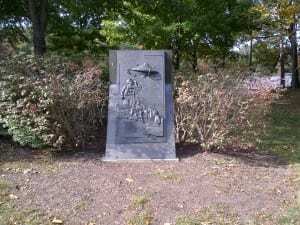 Run from Trenton to Piscataway on the D&R Canal Towpath. They start around 5 AM for the 34.1 mile run! Those who “only” want to run 20 miles start at Rocky Hill. WWBPA will be at the Farmers’ Market on June 1st to celebrate their 10th anniversary. Stop by our booth and say hi before you head out hiking, walking and biking! Join the WWBPA for the last of our 2012 bike rides. Our goal is to help you feel comfortable getting around by bike and showing you some new routes. The next one is Sept. 15 (rain date Sept. 16th): a five-mile loop down the Trolley Line Trail and along Penn-Lyle past High School South and back to the park. Meet at the tennis courts at Community Park (North Mill Road entrance) at 2:15 p.m.; ride leaves at 2:30 p.m.
Our last ride will be Oct. 6 (rain date Oct. 7). Our sixth annual Community Bike Ride (plus walk) is an 8-mile round trip down the D&R Canal to Brearley House and the new Lawrence Hopewell Trail, and back. Come learn about this new 20-mile route! 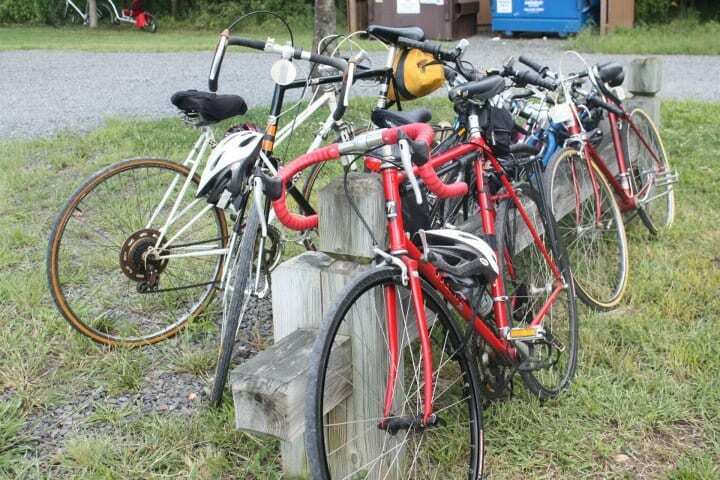 Meet at 2:15 p.m. at Turning Basin Park parking lot (Alexander Road and the towpath); the ride leaves at 2:30 p.m. Walkers, meet at Port Mercer parking lot, 4278 Quakerbridge Road, for a 2.5-mile loop, also at 2:15 p.m.
No preregistration is necessary for either ride; just bring a bike in good working order and a helmet. The ride itself is free. Children under 13 should be accompanied by an adult. We will adjust routes as needed because of road construction. Check back on our website or Facebook page for final details. 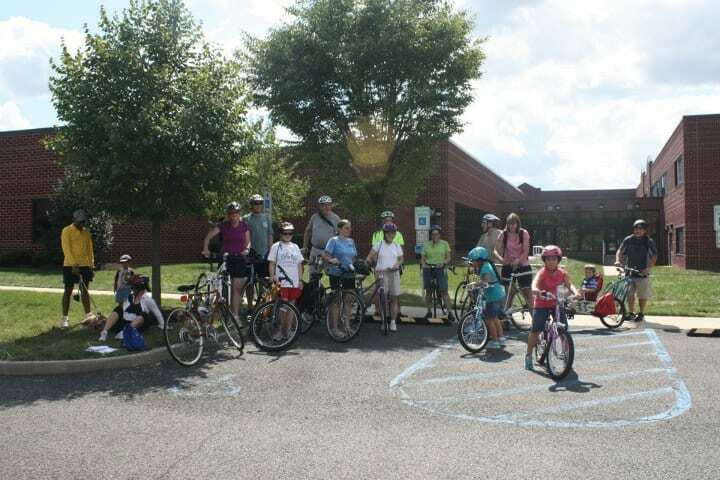 Our August ride was to Plainsboro Preserve. Nearly 20 people took part. The kids loved the bugs; the adults discovered the point jutting into the lake. Some of us rode from Community Park, and others met the group at Town Center Elementary School. The missing link between the South Mill Road crossing of the Trolley Line Trail and the section bordering the Dataram property was finished just before Christmas – what a busy year for bicycle and pedestrian improvements! Thanks to the township and county for all their great work in 2011. The subject of a previous post a few weeks ago, the crossing features a rapid flashing beacon (flashing strobe lights), high visibility crosswalk paint (the thickness of the stripes makes it easy to see) and a pedestrian-activated signal button for easy crossing. One thing bicyclists in the bike lanes on South Mill Rd should keep in mind: If someone is crossing, the bicyclist must stop before the crosswalk, just as the cars must stop. Enjoy the new trail; now it’s easier than ever to get between Rabbit Hill Road and Penn Lyle Road on the Trolley Line Trail, including access to Community Park. It’s a challenge to keep up with all the improvements that have been completed this year, including the long-planned Penn Lyle Road project, which includes repaving, bike lanes and sidewalk connections. Thanks to the township for getting this done, even including porous pavement for the sidewalks! Penn Lyle Road is a key connector between WW-P High School South and the bike lanes on Woodmere Way and Village Road, as well as to the Trolley Line Trail, a multi-use path that connects to Community Park and on to the bike lanes on Rabbit Hill Road, Bennington Drive and Southfield Road. 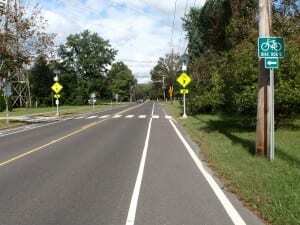 Including the new multi-use path along South Post Road, you can now bike from Mercer County Park, at either the Mercer Oaks Golf Course or at the Caspersen Rowing Center, to Village Elementary School or Grover Middle School, and on to McCaffrey’s grocery store, all via bike lanes or multi-use paths. 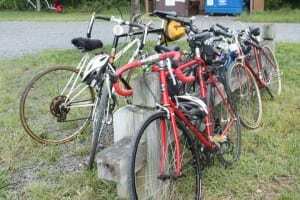 There are few gaps left in the biking or sidewalk network in the eastern part of the township. Naturally, experienced bicyclists don’t regard these improvements as necessary, since they (we, actually) are comfortable driving our bikes in traffic, following the laws like anyone else on the road. 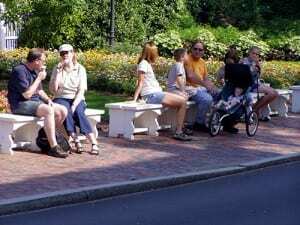 For casual bicyclists, however, the bike lanes and paths provide the extra perception of safety that enables them to bike places they would not feel comfortable reaching without those facilities. Please keep in mind that there are some things to watch out for when biking in a bike lane or on a path. Whenever there’s an intersection or driveway, many drivers pay attention to the middle of the road to look for a car approaching, but may not look to the edge where the bike lane is, and so may not notice a bicyclist entering the intersection or driveway. Also, if cars are backed up, someone turning through a gap in the cars may not see an approaching bicyclist (or a pedestrian on the sidewalk at a driveway), since the driver is paying attention to the gap in cars but not yet to the space beyond. Just keep an eye out for these common causes of crashes, and you’ll be able to avoid them. A new trail crossing was installed recently where the Trolley Line Trail crosses South Mill Road, including a crosswalk with high visibility markings and a pedestrian-activated rapid flashing beacon, which flashes yellow strobes when the button is pushed. 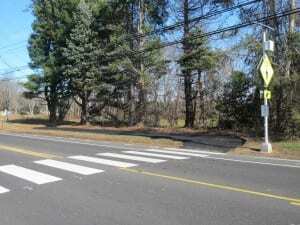 Thanks to the township and county for making crossing South Mill Road safer! 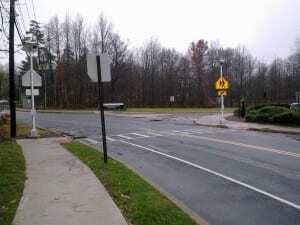 A few details remain, however, and a WWBPA trustee met with township and county engineers to explain the issues, such as placing the buttons for easy accessibility and connecting the crossing to the trail on the east side of the road, which is about 65 feet further north. We’re confident these will be addressed in the not-too-distant future. A sign that will soon disappear? 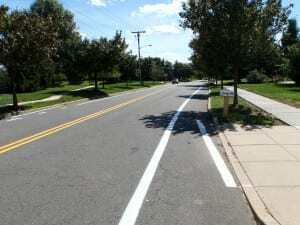 West Windsor soon will install a “rectangular rapid-flashing beacon” where the Trolley Line Trail crosses South Mill Road so that trail users can safely cross this 50-mile-an-hour road. With a push of a button, users can alert motorists to their presence. Signage also will be changed. 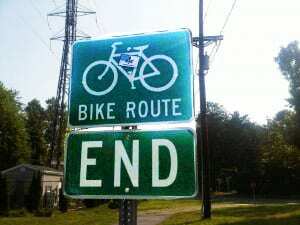 Bicyclists and walkers currently see a “Bike Route End” sign when coming from Penn-Lyle and Brian’s Way. That was put in before the missing link along the Dataram property was added a couple of years ago, and some users are unaware that the trail continues through Community Park to Rabbit Hill Road. In addition, the gaps in the sidewalk on Penn-Lyle will be filled in so that there is a continuous sidewalk on the Trolley Line Trail side of the street from Village Road to High School South and Clarksville Road. Work on this could begin this year and should be finished in 2011. The WWBPA thanks the township for these improvements.